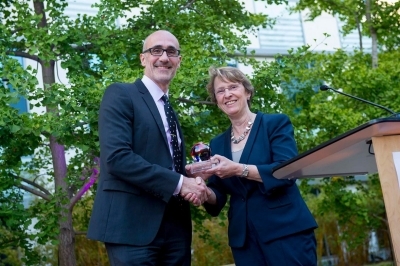 The Pardee RAND Graduate School presented Arthur C. Brooks (cohort ’96) with the 2016 Alumni Leadership Award. This award recognizes alumni who show leadership in their careers, a commitment to public service, and have made exemplary contributions to public policy. Arthur was recognized on June 17, 2016, at a celebratory dinner during Commencement Weekend. Arthur’s remarkable career and publications span a wide breadth of issues and ideas, emphasizing the intersection of public policy, culture, and economics. He is the author of several best-selling books; is published frequently in the Wall Street Journal, New York Times, and other major newspapers; and can be heard often on talk shows as well as in his recent, popular TED Talk, "A Conservative’s Plea: Let’s Work Together." In his current role as president of the American Enterprise Institute, Arthur works with leaders in business and politics to further the ideals of free enterprise and increased opportunity across the country. Arthur is undoubtedly one of the leading and most effective voices in politics and public policy today, and he is constantly working to be the answer to critical policy issues facing the global community. Pardee RAND is proud to have him as our 2016 Alumni Leadership Award recipient. More information about this award and past recipients can be found on the Alumni Leadership Award page. Learn more about the Commencement Weekend Policy Discussion, Celebratory Dinner and Graduate Commencement Ceremony on our Commencement page. Arthur C. Brooks is president of the American Enterprise Institute (AEI). He is also the Beth and Ravenel Curry Scholar in Free Enterprise at AEI. Immediately before joining AEI, Brooks was the Louis A. Bantle Professor of Business and Government at Syracuse University, where he taught economics and social entrepreneurship. Brooks is the author of 11 books and hundreds of articles on topics including the role of government, fairness, economic opportunity, happiness, and the morality of free enterprise. His latest book is the New York Times best-seller The Conservative Heart: How to Build a Fairer, Happier, and More Prosperous America (Broadside Books, 2015). His other books include the New York Times best-seller The Road to Freedom: How to Win the Fight for Free Enterprise (Basic Books, 2012), The Battle: How the Fight Between Free Enterprise and Big Government Will Shape America’s Future (Basic Books, 2010), Gross National Happiness (Basic Books, 2008), Social Entrepreneurship (Prentice Hall, 2008), and Who Really Cares (Basic Books, 2006). Before pursuing his work in public policy, Brooks spent 12 years as a classical musician in the United States and Spain. Brooks is a frequent guest on national television and radio talk shows and has been published widely in publications including The New York Times, The Wall Street Journal, and The Washington Post. Brooks has a Ph.D. and an M.Phil. in policy analysis from the RAND Graduate School, now the Pardee RAND Graduate School. He also holds an M.A. in economics from Florida Atlantic University and a B.A. in economics from Thomas Edison State College. The Pardee RAND Alumni Leadership Award is designed to recognize prominent alumni who show passion, leadership, and discipline in their careers and who have made exemplary and important contributions through public service and to public policy.